Lambeth College is a community college. It has been serving the community for many years providing a second chance to those students who did not succeed in gaining the qualifications they desired at school. The conditions that teachers teach in are the conditions that students learn in. These changes to our contracts will mean that staff will not be able to continue to deliver the excellent education that students deserve. We call upon all trade unionists to join our mass picket and to support our fight to defend education by helping us defend conditions that people teach and learn in. Lambeth College is a community college. It has been serving the community for many years providing a second chance to those who did not succeed in gaining the qualifications they desired at school. The conditions that teachers teach in are the conditions that students learn in. These changes to our contracts will mean that staff will not be able to continue to deliver the excellent education that students deserve. We call upon the trade union movement to support our fight to defend education by helping us defend conditions that people teach and learn in. 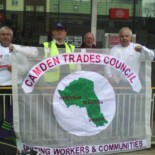 This entry was posted on April 29, 2014 by CAMDEN TRADES COUNCIL.